Voces (“Voices”) is a performative installation that addresses the mass femicide of Chihuahua, Mexico. 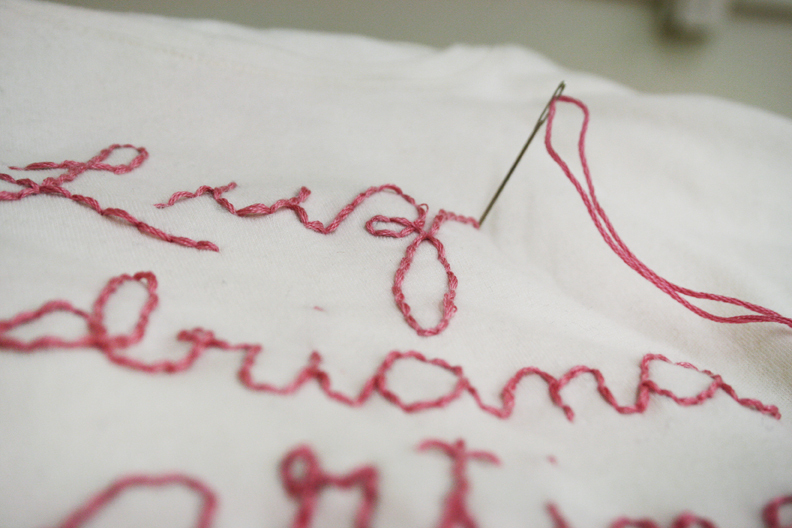 An ongoing act of mourning and protest, I silently sit to the side of the gallery, embroidering the names of individual murder victims into white blouses. Beginning with the first documented victims in 1993, every woman is commemorated with pink thread, referencing the pink crosses that have been erected and painted throughout the city by those who mourn the dead. As the shirts fill the center of the room, memorial shrines and missing person posters line the walls. Having resided in El Paso, Texas as a child, I find a jarring incongruence between my fond memories of Juarez and the city I now hear about on the news. I remember the shock, disgust and sorrow I felt when I first became aware of the femicides in Chihuahua. The majority of victims, from low income families, are between the ages of 14 and 30. Many are raped, beaten, tortured, strangled and sometimes shot to death, their mutilated bodies discarded in the dessert, or left by the highway. The motives range from gang initiation rituals and sport killings to domestic abuse. Voces also aims to make the Chihuahua femicides a very real and urgent dilemma to a United States audience and solicit change on both sides of the border. Regardless of ethnic background, viewers are endowed with power by mere virtue of their residency on this side of the border. They assume an implied responsibility as consumers of such companies as Alcoa, General Electric, Du Pont, Ford, Johnson & Johnson and Kenwood, US-owned corporations that continue to operate Juarez factories where many of these women are employed and often exploited – an exploitation directly linked to the social climate of the femicides. Voces presents viewers with the perspectives of those who suffer under the current system and calls them to recognize their ability to act in the victims’ favor. Mandy Cano Vilalobos is an artist and educator based out of Grand Rapids, Michigan. She received her M.F.A. The George Washington University in Washington D.C., and is currently a professor at Calvin College in Grand Rapids.